A Pahrump man was arrested last week by Las Vegas police after allegedly using a stolen vehicle, which led to a much larger discovery in Pahrump. 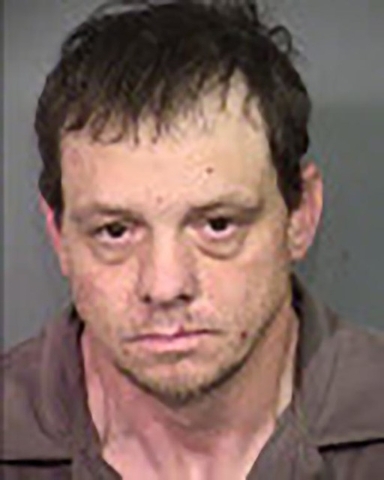 Brandon Scott, 39, was taken into custody by the Las Vegas Metropolitan Police Department on March 26 on preliminary possession of a stolen vehicle charges out of Clark County. After Scott was in custody, Metro Police’s VIPER Auto Theft Task Force contacted the Nye County Sheriff’s Office asking them to check on Scott’s residence for possible stolen vehicles being stored onsite. NCSO detectives responded to the residence Scott was renting from a property owner on the 2300 block of Dyer Court where detectives discovered nine vehicles, two that were confirmed to be reported stolen, as well as seven other vehicles that are believed to be stolen. All nine of the vehicles were impounded and further investigation will be completed. Scott is in custody with Metro for multiple felony charges, with charges pending for the alleged stolen vehicles found in Pahrump. Scott is believed to the sole person involved in the suspected auto thefts at this time.